Sevenoaks Oxford store opens with special offers | What Hi-Fi? 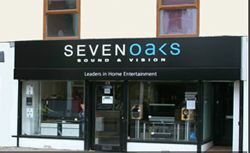 Sevenoaks has opened a new store in Oxford and is celebrating with offers on a range of kit from TVs to soundbars to AV receivers. The new store sells hi-fi, home cinema and multiroom systems, and has space for 3D home cinema demonstrations of the latest kit. Products on show include TVs from big-hitters Panasonic, Samsung and Sony, high-end audio kit from the likes of Marantz and Pioneer and streaming solutions from Naim and Sonos. Plus plenty more besides. The opening offers are available in store from Thursday 18th to Saturday 20th October at the Sevenoaks Oxford store at 41 St Clement's Street, OX4 1AG. See the Sevenoaks website to find out about all the opening day offers.